Easy Halloween treats kids can make on their own or as a group party project...FUN & FOOD & FUN & FOOD! Classic popcorn balls taste even better when you sneak in a few candy treats! 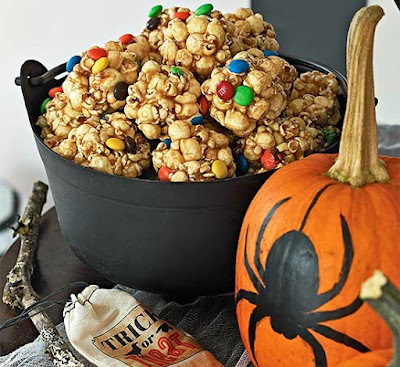 Coat your microwave popcorn with homemade brown sugar syrup, then sprinkle with candy-coated chocolate before rolling into balls. 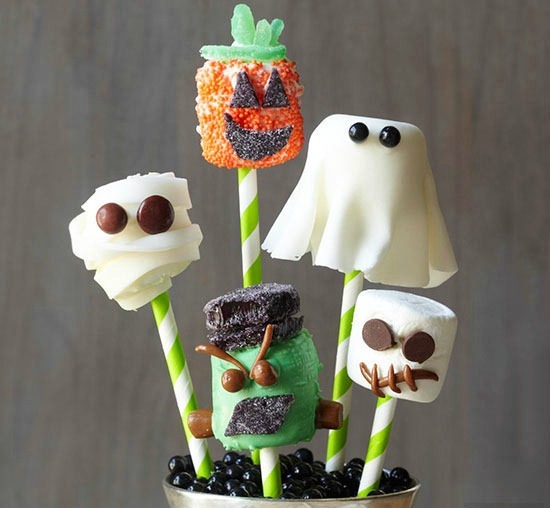 For a quick and spooky Halloween treat, use marshmallows and fondant to form tasty ghouls. Tint the fondant and use candies and pretzels to decorate each ghoul to ghastly perfection. For a tall white ghoul, use clean scissors to snip one end each from two large marshmallows. Press the cut ends together. Roll fondant to about 1/4 inch thick. Cut out a 4-1/2-inch-diameter fondant circle. Shape the fondant over the marshmallow stack. Add eyes and a mouth with decorating gel. To color ghouls, tint fondant with a small amount of food coloring. For the striped version, roll small ropes of different colors of the fondant. Press ropes together and roll out with a rolling pin. Finish as directed above. If desired, use small candies for features, attaching them with decorator frosting. Craving something salty and sweet? This irresistible blend of pretzels, chocolate, and candy is frighteningly good and an easy Halloween treat. Line a 15-in. x 10-in. x 1-in. pan with foil. Brush with 1 tablespoon melted butter; set aside. In a microwave-safe bowl, melt white chips then stir until smooth. 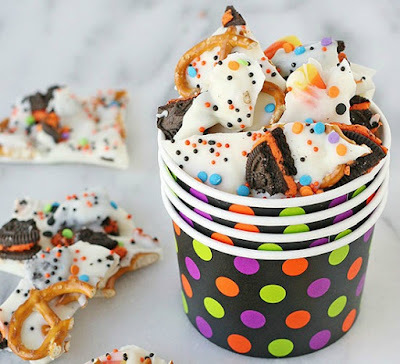 Stir in the candy pieces, small pretzels and cookie pieces of your choice. Spread into prepared pan. Chill until firm. Break into pieces and fill paper cups. 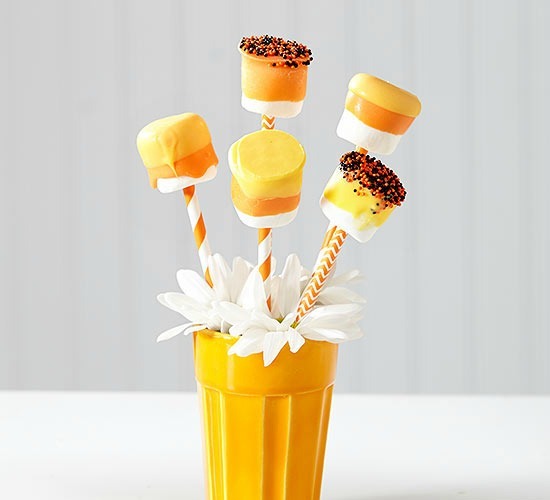 Melt, dip, and dry are the basic steps to enjoy these delightful marshmallow pops.Place orange-color and yellow-color candy coating discs in separate microwave-safe bowls. Microwave separately on high until melted and smooth, stopping to stir every 30 seconds. Insert straws into bases of large marshmallows. Dip part or all of each marshmallow in candy coating, spooning it over if necessary and letting excess drip off into bowl. If desired, sprinkle with orange and black nonpareils. Lay marshmallows on waxed paper (or insert straws into florist's foam to avoid a flat side) to let harden. For two-layer candy corn marshmallows, omit the nonpareils. After the first coating layer has firmed up, dip the marshmallow in a second color of candy coating, keeping the first layer of coating visible. Let stand on waxed paper or in florist's foam until coating is firm. 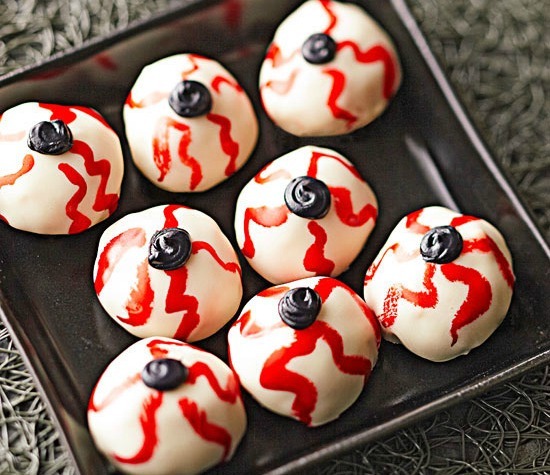 You won't be able to take your eyes off of these eerie Halloween peanut butter bites. In a mixing bowl stir together 1/2 cup peanut butter and 3 tablespoons softened butter. Gradually add 1 cup sifted powdered sugar, stirring until combined. Shape into 1-inch balls; place on waxed paper. Let stand until dry, approx 20 minutes. Chop 8 ounces of vanilla-flavor white candy coating. Place in a heavy saucepan; cook and stir over low heat until melted and smooth. Cool slightly. Dip balls, one at a time, into coating. Let excess coating drip off balls. Place on waxed paper; let stand until coating is firm. Use a clean small paintbrush and red food coloring to paint veins on the coated peanut butter balls. Pipe small dots of black icing for pupils. Beady-eye blackbirds aren't so menacing when they're Halloween treats. 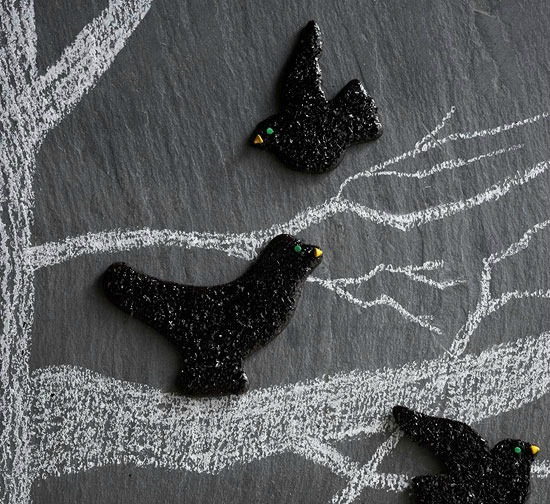 Use bird-shape cookie cutters or sub in other black Halloween figures, such as a cat or a witch to make sugar cookies (you could even die the dough for a real menacing look). A brushing of corn syrup after baking is the trick to getting the black sugar coating to stick. 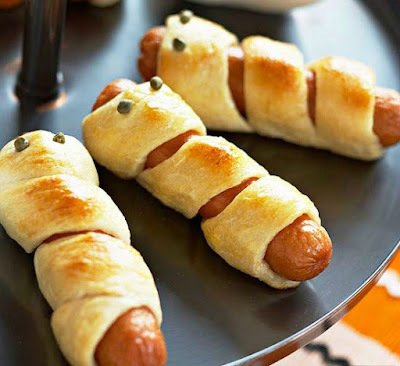 Hot dogs are a party favorite and will become the star of a Halloween buffet when given this mummy-wrap treatment using refrigerated breadsticks. Simply wrap a breadstick around a hot dog and bake. Use whatever you can come up with that everyone will like for the eyes. Pepper corns are used here...hmmm! Kids will love decorating these chocolate mousse cups with edible bones, gummy worms, and headstone cookies! Simply fill cups with pudding, crush hydrox cookies to put on top as dirt and tuck in gummy worms. 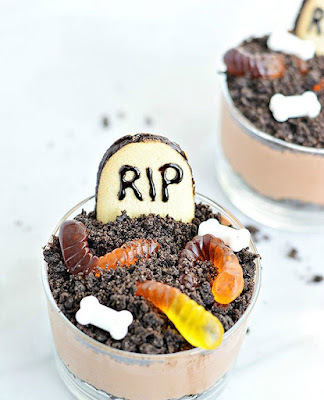 Use sandwich cookies and an icing pen to write RIP. 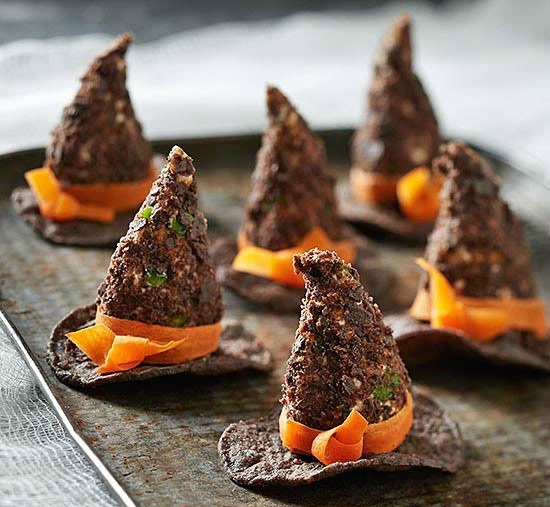 Cast a spell on your next Halloween party with this savory snack. Though it might look like you should wear them, these fashionable witch hats are actually taco-flavor cheese balls atop tortilla chips.